The Law School Admission Test (LSAT) is the first step in applying to almost any law school approved by the American Bar Association. This daunting test is designed to determine a test-taker’s ability to handle the rigorous curriculum at law school and shouldn’t be taken lightly. Some basic understanding of the format and components of the LSAT can help you in your study and preparation for exam day. This exam is one of the more difficult standardized tests out there and will take up about half of your day as it consists of six separate sections. Each of the sections take 35 minutes each so after factoring in any possible breaks, you’ll be at the testing center for quite some time. Plan on spending exam day at one of many testing centers around the world where the LSAT is administered four times a year, in June, September or October, December, and February. The Law School Admission Council (LSAC), the association that administers the exam, announced that they will begin testing six times a year in the 2018-2019 school year to open up more opportunities as people prepare to further their education. Your exam score will come from four of the six sections while the other two sections include a non-graded experimental section (often referred to as the variable section) and a writing section that isn’t graded but is sent out to each of your prospective law schools. The four graded sections include two separate logical reasoning sections, reading comprehension and an analytical reasoning section. The graded sections are made up of multiple-choice questions. The variable section is mostly for questions and formatting that LSAC is experimenting with for future tests. Finally, the writing section is exactly as it sounds, a timed written essay based on a prompt where the test-taker must make a decision about a small, non-controversial topic and argue their side. Graded on a scale from 120-180, the LSAT is designed to measure an individual’s comprehension and logical reasoning abilities. The exam has proven to fairly accurately predict a test-taker’s aptitude in the skills required to succeed in law school including critical thinking and analysis. Although some of the sections sound similar to those found on other standardized tests, like reading comprehension and analytical reasoning, the LSAT is advanced with questions to test clear understanding and critical thinking in extremely long and complex scenarios. The Law School Admission Test (LSAT) is exactly as it sounds, a requirement for admission to most accredited law schools. Although there is some discussion about some schools accepting the GRE for upcoming application cycles, the LSAT is the only exam officially recognized by the American Bar Association (ABA) which is the accrediting association for law schools. So the only safe bet at this time is to go ahead and register for the LSAT. The LSAT is one of many factors taken into consideration during the admission process to any ABA-accredited law school. They will look at previous transcripts, resumes, and letters of recommendations. But the exam plays a large role as it is a fair-across-the-board way to measure you against other applicants. Consisting of six separate sections, the exam takes approximately three and a half hours and measures the test-takers skills and abilities in areas applicable to learning and practicing law. The sections are reading comprehension, analytical reasoning, two separate logical reasoning sections, an unscored experimental-question section and an unscored writing portion. The first four make up your actual score while the fifth is just for test officials to experiment with new questions and formats. The final writing portion does not factor into the score but your written piece is sent off to each school you apply to. In 1945, Columbia Law School Admissions Director Frank Bowles took on the task of filling the need for a better admissions test for law school applicants. Partnering with representatives from Harvard and Yale Law School’s the group began drafting what would be the first version of the LSAT. Many other schools were open to experimenting with the final version they created and after a meeting with many schools represented in late 1947, the first LSAT exam was administered the following year. If you’re planning on taking the LSAT, some of most important questions you may have is where and when can you take it. The exam is administered by the Law School Admission Council four times a year starting in June. The most popular exam is the September/October timeframe as people prepare for the following year’s admission. The final two options are December and February. The LSAC announced that they will began administering the exam six times a year starting with the 2018-2019 cycle. The exam can be taken at different testing sites where you will need to plan on spending half the day. Each of the six sections is 35 minutes and when added with breaks will take a bit of time. After you’re finished though, you are one step closer to reaching your goal of eventually graduating law school and landing the job of your dreams. Almost everyone who takes the GRE wants to know ahead of time what they “need” to score in order to get into grad school. Of course it all depends on what type of program and what particular school, but there are ways to determine what an “average” score is and what you would need to be above that and better your chances of getting into the program you want. The GRE test is broken down by percentile of other test-takers so the average would be right at 50 percent which is (basically) 150 for verbal and 152.6 for quantitative reasoning. To further explain the scores, an example of above average score for verbal would be 155 which is at about 69 percent. That means that you would score above 69 percent of other test takers in that section. Most scores fall around the average (either 150 or 152.6) so the scores just above and below this area include fairly small percentile changes when compared to farther away from the average. This can be seen in the fact that almost half of all the test takers will score between 145 to 155 in the verbal area. It’s only a range of ten that includes over 40 percent of test takers while the range of 160 to 170 only contains barely more than 10 percent (a range from 87 to 99 percent). The analytical writing section is scored separately on a score of 1.5 to 6.0 and the average is about 3.6. Again, the vast majority of test-takers score somewhere in the average range. 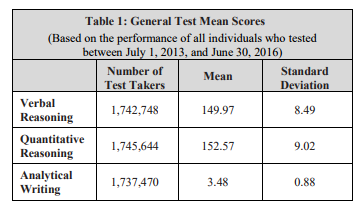 Of course these “averages” are simply the average for overall GRE test-takers. This doesn’t reflect the averages of individuals actually in grad school or in various programs. Research into the respective school should reveal required scores or at least a baseline of accepted students in the past. Finally, anyone preparing for the GRE should simply ask themselves the question “What’s the best score I can get?” While knowing the average and requirements might be nice, everyone should push themselves to the very best of their own ability and be proud of their own accomplishments. No one really enjoys studying. The act of preparing for an upcoming exam can be so overwhelming and negatively viewed that just getting started can take an enormous effort and continuing to study until the end can seem almost impossible. Motivation is key to a successful study session and certainly to a thorough study plan that will prepare you from beginning until the end when you walk in and take your exam. Since motivation for a task as not fun as studying might not come naturally, test-takers should familiarize themselves with ways to get and stay motivated. You might be surprised to find out you can actually force yourself to get motivated, even in studying for an upcoming exam. The key to getting started is just that, get started. You can (usually) force motivation in the following ways. Get started, regardless of whether you want to. If you sit down and force yourself to get started, the process will work itself out and motivation to continue and get into your studying will come eventually. Begin by making a plan. If you don’t know where to begin studying, making a plan can be the best place to start. Motivation will definitely come as you set and make prepared certain milestones. Mapping out your study plan and setting these goals will help you get motivated. Start small. Taking small, easily surmountable steps can help you get the motivation ball rolling. When you need to start studying, you can start with a small first step, like studying five vocabular words for a few minutes. Then add on small steps a little at a time. Whether you’ve had to force your initial motivation or it came surprisingly natural, staying motivated until the end can be equally if not more challenging. If staying motivated is becoming a problem, here are some tips and tricks to help along the way. Picture the end result. Once you get started, you’re already on a journey to a successful completion of a very important goal, thoroughly preparing yourself for one of the most important exams you’ll ever take. Reminding yourself of the end result can help you to stay motivated as you chip away at your study plan. Take much-needed breaks. While you might not want to break up the motivation after you’ve gotten on a roll, getting up and taking a break is vitally important, not just to the overall study efforts, but specifically to keeping your motivation fresh. Get up and move your body when you can or do the opposite and take a quick power nap. It might even be helpful to set a timer as you study so you know you can throw yourself into your efforts completely, knowing you’ve got a well-deserved break coming up in 10 minutes or so. Incorporate motivational media. From videos to music to posters, people have created endless products to help boost motivation. Surround yourself with these inspirational images and audio to help keep your own mind on the right track and continue pushing yourself to the best of your ability. Whether you’re forcing motivation or looking for ways to keep it on track one thing is certain, finding and honing that motivation will be key to performing your absolute best during your exam preparations and therefore, on the exam itself. The GMAT is to business school what the SAT is to undergraduate school. It’s a necessary step that shouldn’t be taken lightly. The GMAT, or the Graduate Management Admission Test, is your ticket into the business program of your choice and a lot of time and study should be taken as you prepare to take the monumental exam. This is the longest section of the test at 41 questions and you are allotted 75 minutes to complete it. There are a few different kind of questions including those to test reading comprehension and critical reasoning as well as some basic grammatical sentence correction. The reading comprehension questions are exactly what they sound like. They will test your ability to analyze a specific academic passage to determine the intended reasoning and attitude. Critical reasoning is designed to test your ability to evaluate arguments. After reading a short argument you’ll be asked questions to determine your ability to analyze it. Sentence correction questions are straightforward, consisting simply of sentences with underlined sections that’ll you need to find the correct series of words for. Quantitative is the only other section that allows 75 minutes for completion although it is slightly shorter with only 37 questions. These questions make up the mathematical portion of the exam and consist of problem solving and data sufficiency. The problem solving is your basic mathematical test consisting of multiple-choice questions. They cover anything from high school math to algebra along with geometry questions. Questions falling in the data sufficiency category are a little more unique as they are presented in a way to test your critical thinking skills. You’re given a question along with a couple sets of data and the only thing you need to do is determine whether you have all of the information required to find the answer to the question. One of the two 30 minute sections, the integrated reasoning portion has only 12 questions total and includes a few different categories within the section. These categories include multi-source reasoning, graphics interpretation, two-part analysis and table analysis. These questions are designed to really make you think and determine your logic and analytical skills. Just as it sounds, the analytical writing assessment is the writing portion of the GMAT. You are allotted 30 minutes for this category in which you must create a well-structured essay based on a brief argument. You will not be arguing your opinion but instead analyzing the original author’s presentation of his or her opinion. This writing portion is designed to determine your overall writing skills as well as your analytical skills. Writing clearly and logically is important. This portion of the exam is actually scored by both a human grader as well as a computer grading system as opposed to the other portions which are graded simply on a computer system. These sections make up the GMAT and all serve a similar purpose, to identify your basic knowledge and understanding and your ability to analyze and think logically, important factors in the MBA program. The total time allotted for the whole exam is three and a half hours and can actually be done in whatever order you choose. The GRE and GMAT are extremely intimidating exams that both come with their own set of obstacles and own benefits over the other. With more and more MBA programs accepting either one, more and more test-takers are facing the decision: Which one should I take? Obviously the first thing you should do is check the requirements of the program to which you’re attempting to apply. The GRE is a requirement for most master’s degree programs while the GMAT is a requirement for most business degrees. More than 1,000 business programs are now accepting either GRE or GMAT and more and more are added each day. So checking with your school or program is the first step you should take. If for some reason you can’t find out or are still weighing out business programs, know that the GMAT is the normal requirement and more than 6,000 programs nationwide accept this test score. If you’re attempting to get an MBA, the GMAT is the safer route to take. This is a small influential factor and certainly should be how you ultimately decide which test to take. The difference is so small, it’s almost not worth mentioning. The GRE costs right around $200 while the GMAT costs $250. Considering the other differences between the two tests, cost should only be a factor if you really can’t decide based on any of the other factors. This another very minor factor, even more so than cost since the two tests have very similar options. Each test is taken on the computer at test centers around the world year round. The only difference here is that the GRE is offered as a paper-based test in select areas where the computer-based one isn’t an option. Some research can be done to find the testing center closest to you as well as their testing schedule. These factors might play a role in your decision since one might be at a more suitable time or closer location than the other. However, with the wide option of test centers and schedules, odds are you should be able to find an option for either the GRE or GMAT and so this, like the cost, shouldn’t be a very influential part of the decision of which test to take. Of all the factors, the one that should play the largest role as you decide which exam to take is which one is easier for you. This is not an easy question to answer however as each test is designed to be difficult and test your knowledge and abilities in similar areas. However, a little further research into each exam might reveal your inclination toward one over the other. The math section of the GRE can be easier as it is more straightforward and allows the use of a calculator while the GMAT is more analytical and problem-solving based. At the same time, when it comes to the formatting of the questions in each exam, there are mostly multiple-choice questions on the GMAT while the GRE offers many multiple-choice AND multiple-answer questions. Many people find taking multiple-choice exams to be easier while questions that allow for multiple answers for each question can be more difficult. In the end, the best way to determine which testing format suits you best is to start going through practice questions or even a whole practice exam and find out which one works best for you. Finally, if you really can’t decide, if it’s possible, it might not hurt to officially take each exam to see which one you perform best at. If you choose to take both the GRE and GMAT however, make sure you thoroughly study and prepare for each one to the best of your ability. The GRE is a comprehensive exam usually taken on a computer. There is a paper-based option for those in areas that don’t offer the computer-based test. The computer-based exam actually allows for a test tailored to your level of knowledge and understanding. As you go through the questions, each one will be harder or slightly easier based on whether you got the previous answer correct. Made up of three basic sections, the GRE is designed to test your ability to handle an accelerated degree program. These sections include verbal reasoning, quantitative reasoning (math) and an analytical writing portion. The verbal section measures a test-taker’s grammatical skills and reading comprehension. The quantitative reasoning portion determines your basic understanding of basic arithmetic, algebra and geometry. Finally, the writing portion is simply that, the essay portion of the GRE which will identify your writing abilities. You’ll have to write to essays in response to two given arguments and the purpose is not just to determine your writing abilities but also your logical and analytical abilities. Anyone looking to get into a graduate school and some business schools. Master’s and MBA programs around the world use the GRE as the primary exam option for acceptance purposes. So if you’re considering a higher education, this test is probably for you. The GRE is conveniently offered year round although the paper-based test is narrowed down to three times a year, October, November and February. But for most people around the world who will be taking the computer-based exam, a simple search of the testing centers and their schedules will help you find the right date for you. There are more than 1,000 testing centers around the world in more than 160 countries. The obvious answer to why is because it is a requirement to pursue your master’s or business degree. In order to even be considered for admission, you must get that check in the box. As to why these programs require the test, it is simply because it provides a baseline score for schools to see where applicants rank out. Although they look at a wide range of materials including test scores, transcripts, resumes, letters of recommendations and more, the GRE scores are fair across the board since everyone takes the same test and allows the programs to determine who would be able to better handle the tough curriculum. For many people looking to pursue a higher education and create better opportunities for their future career, the GMAT is a large milestone that must first be climbed. The Graduate Management Admission Test, more commonly known as the GMAT, is the standard test for most business school admissions as it determines a test-taker’s knowledge and understanding in critical areas of graduate school ensuring they’re ready and capable of success in the program. What is the Verbal Section? Designed to test your comprehensive understanding of the English language and analytical skills, the verbal section consists of 41 questions in a few different categories: reading comprehension, sentence correction and critical reasoning. It is one of the longer sections , allowing 75 minutes for completion. The other long 75-minute section, this is the math section and contains 37 questions surrounding data sufficiency and problem solving. Questions in this category will test your knowledge of arithmetic including algebra and geometry. What is the Analytical Writing Assessment? The analytical writing assessment is exactly as it sounds, an essay designed to determine your writing abilities This portion of the test is actually graded separately and differently, it doesn’t go into your overall score but receives its own score on a scale from 0 to 6. The time allowed to write the entire essay is only 30 minutes, making it one of the shorter sections of the GMAT. What is the Integrated Reasoning Section? The only other short section at 30 minutes in length, the integrated reasoning only consists of 12 questions. These questions test your reasoning skills in areas like graphics interpretation and analysis. The neat thing about the GMAT and its different sections is that you actually get to choose the order in which you tackle each section. When you first sit down to take the test, you get to organize the four sections in the way you feel most comfortable with. If you want to start off with your strongest section or put the most difficult first while you’re still fresh and clear-headed, it’s completely up to you. The short and simple answer as to why hundreds of test takers sit down to take the GMAT is because it is a requirement for most MBA programs. In order to get into the program you want, you must take the test and you’re going to want to do the best you possibly can to ensure you’re application is competitive enough for acceptance. To break the answer down further and determine why the GMAT is a requirement, just look at the rest of the requirements for MBA admission. Schools and programs can’t accept anyone and everyone who feels like walking through the doors so the need a way to identify the top applicants. Although they look at a large variety of things including undergraduate transcripts, resumes and recommendation letters, a test that clearly ranks applicants’ knowledge on an easily read scale makes the process a little easier and fair. All of the factors are taken together and weighed equally to determine which applicants will get into the program. The MBA is a competitive and highly coveted degree many people pursue at some point in their lives. With so many requirements to get into the school or program of your choice, the GRE or GMAT is easily one of the most important factors. Time and energy should be spent in preparing for the test that could ultimately determine whether you get into your desired program or not. Because of the important nature of these exams, most test takers want to take the one that will be easiest for them. First, you’ll have to do is figure out which test you’ll be taking. More and more MBA programs are accepting either the GRE or GMAT for consideration so a little research into your program’s requirements will let you know if you have a choice or if you should begin studying for a particular test. If the program to which you’re applying is one of the 1,200 nationwide that accept either the GRE or GMAT, you will need to learn a little bit more about each exam to determine which best suits your need and abilities. The question of which is more difficult comes with some caviats and isn’t a one-size-fits-all. The GMAT is structured to test an individual’s analytical and quantitative skills as it is the traditional exam for business schools. However, as everyday business has shifted, so have the requirements to get into business programs. As they look for people with different strengths and backgrounds, the GRE, which is a more straightforward test, is more widely accepted. Although still set to challenge a person’s knowledge, the math section on the GRE requires less elaborate questions and actually allows the use of a calculator for difficult problems. Grammar and vocabulary questions are also different on the two tests. Someone good at memorizing vocabulary might be better suited for the GRE versus the GMAT which is more grammar-structured. Both the GRE and GMAT consist mostly of multiple choice questions, however, the GRE allows for multiple answers for each questions so in that way, it isn’t quite as straightforward as the GMAT. In the end, it’ll take some research into each exam and familiarity with it to determine the best option for you. The absolute best way to decide is to actually take practice tests and review sample questions for both the GRE and GMAT. With similar pricing for each and almost identical overall time allotted, the main difference is going to be the structuring and information included in the questions. Most people tend to gravitate and excel in one of the other so the only way to know is to dive in and start studying. The GRE test is administered annually to thousands of eager students, all coming from different backgrounds, families, educations, and life experiences. Although these scores are a fairly accurate measurement of an applicant’s knowledge and abilities in specific areas, there are many things that must be considered when interpreting the scores compared to other applicants. Any institution or organization receiving GRE test scores are instructed to interpret the scores based on certain criteria. Although the numbers are black and white, there are areas in which those analyzing and comparing scores must consider outside of those hard facts. It’s also important to note that decisions should never be made based on GRE scores alone. Institutions and organizations consider different applicants on their whole package including undergraduate performance and recommendation letters. The testers background is considered when analyzing scores. Many studies have been done to validate the use of GRE test scores but these studies have been conducted with available subjects. Students from non-traditional backgrounds and unique educational or cultural experiences might not have been captured accurately in the studies and should therefore be more carefully considered when interpreting test scores. Similar careful consideration should be done when analyzing test scores of persons with disabilities. Of course any test-taker who’s first language is not English could also be effected by the GRE test, particularly the writing portions. While understanding of the English language is an important aspect to consider for admission purposes, institutions should carefully consider non-native English speakers when interpreting the test scores. Other considerations should be made such as performance on the Test of English as a Foreign Language (TOEFL). Test takers should have a basic understanding of how their performance is officially scored and analyzed. The verbal and quantitative reasoning results are scored on a scale from 130-170 in one point increments. The analytical writing section is scored from zero to six in half point increments based on overall quality and critical thinking skills. Subject tests are graded on a much wider range and vary based on subject. Each subject has an overall score and is weighed for a percentage against other test-takers. There are also subscores for most subjects with different categories that may be considered as they indicate an individual’s strengths and weaknesses within that particular subject.